Of all the books I have read this year, there are two that will be gifts for just about everyone on my Christmas (if I can wait that long--birthdays are coming too, after all) list. One is The House at the End of Hope Street (review to come) and the other is The Illusion of Separateness. Both are books that spoke to something inside me. This was my first experience with a Simon Van Booy novel and what an experience it was! It is poignant and thoughtful. Told in a non-linear way, through the experiences of several different people, each story is connected. This is the story of how one man's act of kindness touched the lives of others. The novel spans from World War II to the present, introducing a cast of characters who the reader gets to know as the story unfolds. I hate to say too much because this really is a book best taken in without too much knowledge about it beforehand. I think my favorite character was John. He reminded me of my grandfather, and his and his wife's love story made my heart melt. Mr. Hugo's story particularly touched me, how he struggled and lived his life. There was Martin, an orphan who was taken in by a French baker and his wife; Sebastian who as a boy stumbles on the remains of a wrecked warplane; Amelia, a blind woman who works for a museum; and Danny whose business is the movies. The Illusion of Separateness was a beautifully written novel, the language simple and concise and yet the images created an the characters described are so real. I cannot think of anything negative to say about the book other than perhaps it was too short. This was a book with heart. It is a book I can see myself re-reading again and again. 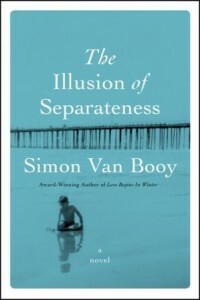 To learn more about Simon Van Booy and his books, please visit the author's website. You can also learn more about the author by visiting his Facebook page, and Twitter account. I hope you will check out what others had to say about The Illusion of Separateness on the TLC Book Tours route! Wendy, I am so happy to get your endorsement on both books, as they are in my TBR stacks and I will certainly move them up in the pile now. I just love when a story or certain characters "speak to me". Diane - I hope you enjoy both even if just half as much as I did! They are worth taking the time to read. YAY! I'm so glad you liked this one. My gushing review of it will be coming up tomorrow or Thursday. Can't remember when I scheduled it, but I've already started gushing about it on YouTube. I just love his work, and I think this might be his best so far. Wow, everyone is loving this book! I can't wait to read it. Kathy - I haven't paid close attention to the reviews of this one, but I am glad to hear it! Ahhhh! I won a copy of this and I'm watching my mailbox like a hawk because I CANNOT WAIT TO READ IT! Jennifer - I hope you enjoy it when you get it! Joy - I definitely want to look at some of his other writing now that I've gotten a taste of what he can do. I've heard only good about this author, though I can't remember the title of the book that was recommended previously. The writing sounds wonderful. I keep hearing wonderful things about this book and the author! I need to finally read one of his books! Iliana - I hope you will give him a try! 5 paws! Wow! This one sounds touching and I loved reading about your reaction to it. Will be putting it on my list for sure! Staci - I think you would like this one! If you want to gift this book, it must be wonderful! I really can't wait to get my hands on a copy. Anna - I hope you enjoy it when you read it. It's such a beautiful story. I love that you give books for Christmas :) Me too! I'll have to track this one down.